One of the best ways to enhance your relationship with your guinea pig is learning to communicate. While guinea pigs generally lack the capacity to learn commands, you can still communicate through tone and familiar noises and routines. You can also learn what they are trying to tell you through their variety of wheeks, squeaks and other noises. Anyone who has fed a guinea pig for more than a week knows that these small animals are certainly capable of learning and remembering things. Guinea pigs quickly learn to associate the noises and activities that immediately precede feeding time, and are likely to speak up any time they recognize that tasty treats are imminent. For example, the rattling of plastic frequently accompanies vegetables, so your pigs may set up a chorus any time they hear plastic packaging of any kind. The best way to communicate with your guinea pigs is through body language and tone. Guinea pigs rarely enjoy it when you pick them up, since reaching into the cage invokes primal prey responses, but moving slowly and speaking in a soothing tone of voice can help calm things down. 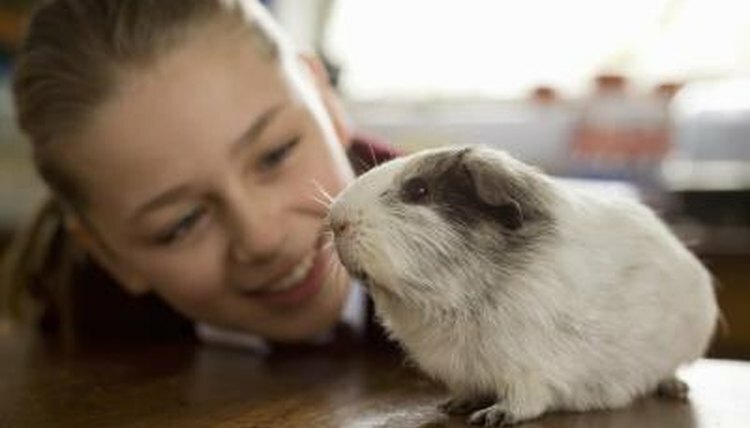 Petting your guinea pig can also be calming, but make sure you hold him securely or put him on a stable surface as quickly as possible to reduce anxiety. Guinea pigs can also pick up on other tones of voice, so if you speak excitedly to your pets when you hand out treats, they may associate that tone with impending food and join in your excitement. The primary way your pigs will communicate is through wheeking, a loud, repetitive, high-pitched cry. In the wild, this was a cry of alarm, but domesticated guinea pigs use it to say, “Feed me!” Guinea pigs may make lower-pitched squeaks to get your attention, either to point out a problem in the cage like an empty food bowl or to request a scratch behind the ears. When a guinea pig is playing or exploring, he may make a series of low burbling or chuttering noises to indicate his happiness and contentment. A rising shriek from low to high pitch can be a sign of alarm, often when one guinea pig feels that another is violating his personal space. A low rumbling noise and a waggling posterior is a sign of dominance behavior, and the guinea pig may follow this up by attempting to hump his cage mates. The ultimate sign of trouble is chattering teeth, which is a guinea pig’s way of saying, “Back off or I’m going to bite you.” While these noises may simply be part of cage life on occasion, you should always check in to make sure nothing serious is about to happen.